If you know me or are following my blog you might know I have oily skin which turns oily-combination in winters. The nose part becomes very oily and I frequently need to give my face a steaming session to get rid of those nasty white heads and black heads (blackheads don't budge although). 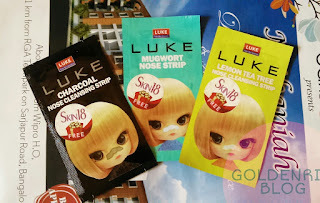 Today we will be talking about the nose strips I received from skin18.com. I received three nose strips and I have used them all and am here to tell you whether they are beneficial or not. The nose strips are to be used after cleansing and I did the same each time. The nose should be thoroughly wet and then stick the strip. The strip hardens after sometime and slowly it is to be removed. Let's see one by one the review of the nose strips which I used at a gap of almost 2 - 3 days. This is the first one which I tried. It was pale green coloured and smelled very synthetic. It smelled as if some burned paper or plastic. The smell didn't linger much though. I kept the nose strip for about 10 minutes after which I felt a stretchy feeling and i removed the strip. My nose felt a little sticky and after dabbing some water it was all smooth. I rinsed it a bit and applied toner (with the thought that it removes the blackheads and open.pores should be closed :D). It didn't remove the blackheads but certainly reduced it size( I don't know how). Overall I was happy with the results. With the lemon tea mentioned in the strip name I expected it to smell like lemon. But to my dismay it smelled like the above strip and the fragrance faded away as soon as I applied the nose strip. This time I kept it for 20 minutes and slowly removed the strip. All my uprooted white heads could be seen on it and my nose was all smooth and evened out. It didn't show any effects on black heads but. I immediately rinsed my nose (but very little sticky residue was left since the strip had hardened) and applied a toner. This strip was black coloured and I followed the usage steps and my nose was free of stubborn whiteheads. As always I applied a toner after the usage. The fragrance of this strip was also synthetic and faded away quickly as soon as I put it on. Overall I think the strips are a good option when you are in a hurry an don't have time to steam and all. Let's see the in and out of the nose strips. Fragance doesn't linger much ( this is a pro for my picky nose). I would really recommend these nose strips for successful uprooting of white heads. If you frequently steam your face and use blackheads extractors then for a change you can surley try these. It is very effective in uprooting large whiteheads also. Do try once if you are looking for a change.